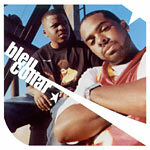 Album from Bleu Collar. Basik 'the Mayor' and Reese 1 'Chuck Taylor' come out with a banger for all the hip hop heads. With uncanny, on-point production, this album is bound to make consistent rotation in anybody's CD player. Songs 2,3,4,9,12,&14 produced by Eligh for G&E Music. Songs 5,8,&13 produced by Mums the Word. Songs 6&15 produced by Slant. Songs 10&11 produced by Champ. Song 7 produced by The Grouch for G&E Music.